Realising you have a health issue that needs medical attention and treatment can cause anxiety. Not only are you uncomfortable, you now have to think about making time to visit your GP and describing your symptoms in order to receive treatment for your problem. 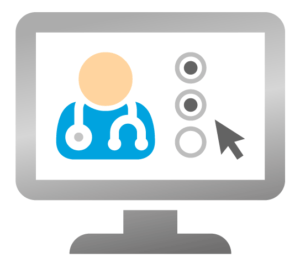 Although in many instances nothing can replace the necessity of a face-to-face visit – an online doctor cannot inspect an injury or feel for soreness, for example – when it comes to determining your health history, responding to a description of symptoms, and prescribing medicine for common conditions, a virtual consultation can be just as effective. From eliminating the need to describe symptoms in person to access to a large amount of information about your condition, there are many benefits of online doctors and prescription services. Legitimate online doctors and pharmacies are regulated by the Care Quality Commission with doctors registered with the General Medical Council. Instead of having to call for an open appointment or wait in your GP’s surgery, with an online service you can submit your information any time and await a response. Filling out an online questionnaire can be even simpler than responding to questions in person. Though not suitable for an urgent or emergency health issue, secure, confidential online consultations are available right from your screen, any time. They offer an alternative to people with busy lives or those with limited mobility to be able to obtain treatment for straightforward health issues. Have an embarrassing health condition? Everyone does at some point in their lives. Perhaps you don’t feel comfortable explaining that you have pain when urinating, an itchy rash in an unmentionable place, or trouble achieving an erection. When communicating with a doctor online, you can avoid having to describe your symptoms in person. This can help motivate some patients to seek help sooner. With a regulated online doctor and pharmacy, genuine prescription medicine is dispensed and posted by a UK pharmacy. It can be delivered conveniently to patients’ homes in discreet packaging. Also, the nature of the condition and how to take the treatment will all be clearly explained before the medicine arrives. Conditions such as hay fever, eczema, cystitis, female facial hair and even erectile dysfunction can be safely treated through an online doctor, provided the patient’s responses show they can safely take the required medication. However, ethical online doctors take a precautionary approach, refusing to carry out online consultations for conditions which require a face-to-face consultation. If a patient’s questionnaire answers or previous order history indicate further review is necessary, they will be advised to visit their normal doctor and an online prescription will not be provided. Furthermore, medicine that could be abused or is addictive, will not be prescribed. In addition to the information and advice provided during the online consultation process, online doctors such as Dr Fox provide a wealth of information to help patients understand more about their conditions. It can be helpful to be able to read up on what you have, in your own time, and absorb information approved by your online doctor. Typically GPs will not have the time during an appointment to provide all the information surrounding a particular condition that you can access online. This gives patients the chance to find out the answers to questions that may not have come to mind during the consultation. To learn more about Dr Fox, how the online consultation process works and how prescriptions are provided, visit our How it Works page, or see the video below. Online symptom checker or online consultation? Posted on August 8, 2016 October 28, 2016 by Dr Tony Steele in Health technology, Online clinic. Where’s the cheapest place to buy Viagra online in the UK?